If you’re a frequent reader of the blog, you probably know how much I enjoy the guided hikes coordinated by Ranger Ernie Ybarra. You may also remember I mentioned that Ranger Ernie was slated to retire near the end of November, 2015, meaning his guided hike program would be coming to a conclusion after running for over a decade. Well, as fate would have it, Ernie has postponed his retirement and is sticking around until at least the first quarter of 2017, which means we’ll get another full year of Ranger Ernie being an incredible ambassador for our city. 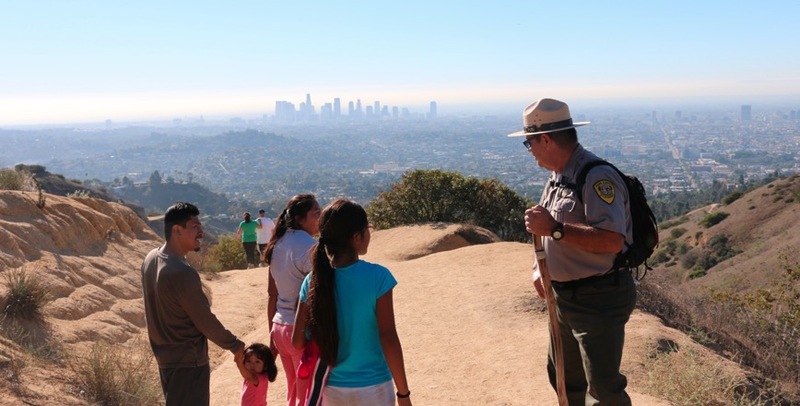 Ranger Ernie Ybarra greets a family while leading a hike to Dante’s View in Griffith Park. Credit: Brian Champlin / We Like L.A.
Ranger Ernie’s hikes provide an informative, fun and family friendly outlet for exploring all that Griffith Park has to offer. 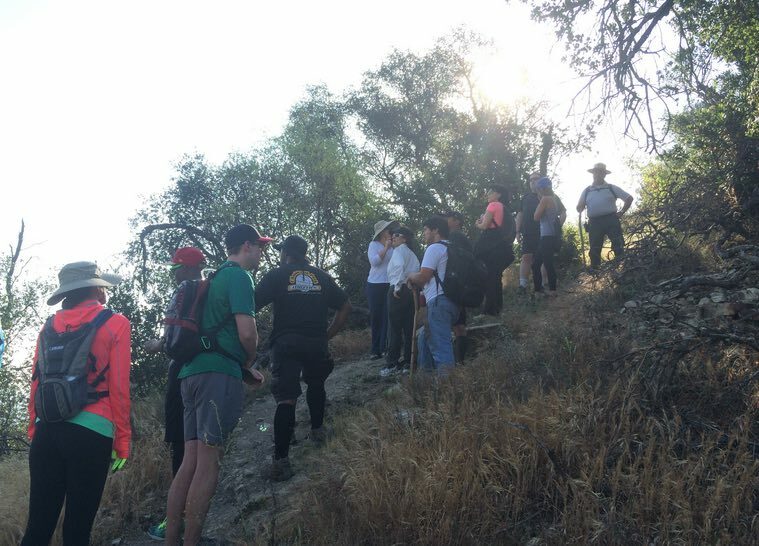 Ernie educates you on the park’s history and natural composition while leading small groups on treks through a myriad of trails and points of interest, from Amir’s Garden to the Dante’s View to the Hollywood Sign. Oh, and it’s 100% free and open to all! In humble opinion it’s truly one of the most valuable public resources that I’ve come across in my time exploring Los Angeles. Check the schedule of hikes after the jump to see if there’s one you might like to join. I have listed the current schedule below and will update with new dates once they’re announced. Unless otherwise noted all hikes begin from the Griffith Park Ranger Station/Visitor Center 4730 Crystal Springs Drive, LA 90027; GPS coordinates: 34°07’58.0″N 118°16’49.2″W. Most hikes will end by 11:00am, though some may extend past noon. Ranger Station > Crystal Springs Dr.> North of Zoo > trailhead > Skyline trail >Mineral Wells (restroom break)> Shane’s Inspiration> Ranger Station. Note: Ernie will bring donuts! Ranger Station > Live Steamers, > Rattlesnake trail > Mineral Wells restroom break > Ranger Station. Ranger Station > Old Zoo picnic area > trailhead > Bee Rock > Bill E. trail > Ranger Station. Ranger Station > Fern Canyon nature trail > Old Zoo area > Ranger Station. Note: this hike will end at 10 a.m.
Ranger Station > Mineral Wells> the steepest road in Griffith Park– Toyon > Rose Hill Trail > Prehistoric Fish Rock > the Saddle > Mt. Chapel Trail > Mt. Lee Road > Aileen Getty Ridge Trail > Cahuenga Peak — elevation 1820, the highest peak in Griffith Park >lunch break > Mt. Lee > Mt Chapel Trail > Water Tank 113> Bill E. Trail > Ranger Station. Note: this hike will end at 2 p.m.; be sure to bring lunch. Ranger Station to Five Points to Riverside Trail to Vermont Canyon Road to East Observatory Road. Small break at the Griffith Observatory then we’ll head back to Boy Scout Trail to Commonwealth Canyon Drive to Vista Del Valle to Fern Canyon Trail and back to the Ranger Station. Note this hike begins at 8:00am. Ranger Station to L.A. Zoo to Bette Davis Picnic Area to Equestrian Center. Small break then we’ll head to L.A. River Bike Trail to Autry National Center to Crystal Springs Drive and back to the Ranger Station. Note this hike begins at 8:00am. Ranger Station to Toyon Canyon to Royce’s Canyon — where P-22 hangs out. Small break then we’ll head to North Trail to Water Tank 112 to Amir’s Garden to Mineral Wells and back to the Ranger Station. Note this hike begins at 8:00am. Ranger Station to Main Trail South to Lower Beacon Trail to Coolidge Trail to 5 points to Fern Canyon Trail and back to the Ranger Station. Note this hike begins at 8:00am. Ranger Station to Bill Eckert Trail to Vista Del Valle to Saddle to Water Tank 153. Small break then to Saddleback to North Trail to Mineral Wells and back to the Ranger station. Note this hike begins at 8:00am. Ranger Station to Main Trail to Golf Club House. Short break then to Mineral Wells Trail to Merry Go Round and back to the Ranger Station. Note this hike begins at 8:00am. Ranger Station to Crystal Springs Drive to Zoo Drive to Travel Town. Short break then to Griffith Park Drive and back to the Ranger Station. Note this hike begins at 8:00am. Ranger Station to Old Zoo then a short break and a class on relaxation before heading back to the Ranger station. Note this hike begins at 8:00am. Sunday, September 4: Intermediate (4-mile) hike to W. Observatory Trail. Meet 7 a.m. at Fern Dell Section 9 parking lot. Sunday, October 2: Intermediate (5-mile) hike to Royce Canyon. Meet 7 a.m. at Travel Town. Friday, October 21: Beginner (2-mile) night hike. This special hike begins at 6:30 p.m. on Friday, October 21. Meet at the Griffith Park Ranger Station/Visitor Center (4730 Crystal Springs Drive, LA 90027; GPS coordinates: 34°07’58.0″N 118°16’49.2″W). Please note that the ranger will be off-duty and leading the hike as a civilian. Thursday, November 24: Annual Intermediate/Advanced (10-mile) Thanksgiving Day hike to the Hollywood Sign. Meet 7 a.m. at Griffith Park Visitor Center/Ranger Station. Sunday, December 4: Intermediate (5-mile) hike to Cedar Grove. Keep in mind all hikes will be cancelled in the event of rain on the specified date . If there is any doubt, please check the Ranger Ernie Facebook page on the day of the hike in question to see if there is any cancellation notice. Be sure to wear hike appropriate clothing and footwear, bring water and (possibly) a hat if you plan to join. For questions and additional information you can email ernie.ybarra@lacity.org or call 323.644.6661.